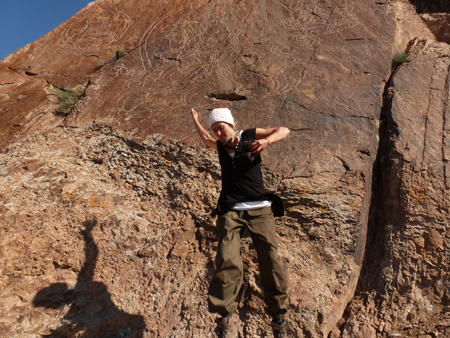 Dr Anne Laudisoit from the University’s Institute of Integrative Biology is photographed here exploring rock holes for signs of animal life near the Ilie River Valley in Kazakhstan, where there are also Buddha carvings assumed to have been left by monks in the 15th and 16th century.Dr Laudisoit is studying Yersinia pestis, the bacterium that causes plague, in great gerbils living in the deserts of Central Asia to understand the maintenance and dynamics of the bacterium in wild populations and how outbreaks of plague in the human population could be predicted in future. Plague is still endemic in the desert plains of Kazakhstan, part of Uzbekistan, western China and Mongolia. Humans can catch the disease when they are bitten by fleas that have fed on infected rodents. The main hosts are great gerbils that live in burrow systems that are visible on satellite images. Following outbreaks of the disease in the 1940s that wiped out some villages in Kazakhstan, a network of anti-plague stations were developed. Scientists collected data from gerbils and fleas to montior the occurence of plague and control the disease when it was coming close to villages. The information, stored in archives, was accessed and put under electronic format in the 1990s by scientists from the University of Oslo, Norway; Antwerp, Belgium; and the University of Liverpool. Several models were developed using the 40 year dataset, which showed that plague outbreaks were related to some extent with climatic conditions and to gerbil density measured as a burrow occupancy percentage on a given territory. They also showed that plague was likely to occur when a burrow occupancy threshold was reached. The model, co-developed by Professor Mike Begon at Liverpool, suggested that detecting when this threshold was reached could act as an early warning system for plague. The model, however, had had some faults and in , order to make the model a useful tool for public health authorities, some refining was required. Dr Laudisoit, is currently working with Professor Begon and a team of geographers from the University of Utrecht, on a new Wellcome Trust grant to collect new ground data to improve the model.